FCA recalls heavy-duty trucks after crash and injury reports due to steering linkage problems. February 5, 2019 — More than 600,000 Ram 2500 and 3500 heavy-duty trucks are recalled after reports of crashes and one injury possibly related to drivers losing the ability to steer the trucks. Included in the recall are 2013-2017 Ram 3500 heavy-duty trucks and 2014-2017 Ram 2500 pickups and 3500 chassis cabs. Fiat Chrysler (FCA US) says a steering linkage nut could come loose and leave drivers at the mercy of the trucks, something that may have already caused eight crashes and one injury. The National Highway Traffic Safety Administration hasn't released details, but Chrysler says nearly 574,000 trucks are recalled in the U.S., nearly 63,000 will be repaired in Canada, 17,582 are recalled in Mexico and more than 5,800 Ram trucks are recalled outside North America. FCA didn't mention when the Ram truck recall will begin but concerned owners may call 800-853-1403. 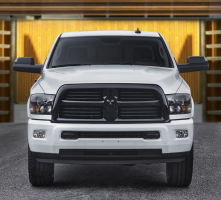 Ram 1500 truck owners also received bad news today when Chrysler announced a recall of 220,000 model year 2019 trucks with adjustable brake pedals that may fall off. CarComplaints.com has owner-reported complaints about Ram 2500 and Ram 3500 trucks.